In January we met with our farmers Candice and Pete Jr. and discussed the upcoming 2019 CSA season, which begins Monday, June 3, 2019 and ends Monday November 11, 2019. The new vegetables and herbs they will be offering this season include: shishito peppers, lavender, amaranth, and a few different winter squash varieties. They are also partnering with a neighboring organic farm to grow their winter squash in order to allow some of their to rest this upcoming season. They will send each share transplants the first two weeks of the season. Sign up for the 2019 Season is open! I wanted to share the farm’s Plum Torte Recipe with you. Its a great way to use up your plums. This week is the start of our fall vegetable harvest with Butternut Squash and Romanesco Cauliflower making their debut. Romanesco Cauliflower is a fun tree shaped vegetable that is packed with flavor and a conversation piece. While it is a variety of cauliflower its flavor profile is closer to broccoli. Prepare it like broccoli. Stoneledge’s butternut squash are sweet and tasty, roasting or steaming them yields great results. Tomatillos are back! Our own Kelli Foster shared these two recipes that highlight tomatillos. Tomatillos: Great is Mexican or Spanish cooking! Make them spicy, make them sweet. Either way works! Edamame Beans: Rich in fiber, antioxidants and vitamin K. Commonly found in Asian cuisines. Since Labor Day falls on a Monday, September 3rd our pick up that week will take place on Thursday, September 6, 2018. The Fall Farm Festival and Potluck is Saturday, September 1st on the farm from 11:30 AM-3 PM. Sweet Corn will only be available until September 6th, Week 14. The Fall Farm Festival and Potluck is 3 weeks away. Saturday, September 1st here on the farm. from 11:30 AM-3 PM. Chelsea CSA is chartering a bus to the farm. The cost of the bus tickets are $5 per person. The bus will leave from the Chelsea CSA/Hudson Guild Elliott Center, 441 West 26th St, New York, New York 10001 at 8:00 AM and is expected to return at 6:00 PM. If you plan to drive use this address for your navigation system: 145 Garcia Lane, Leeds NY 12451. Bring your family and friends for a day on the farm. It is a great day to visit the farm and see how your vegetables are grown, meet your farmers, and walk the fields. The farm will grill pork and sweet corn along with a Stoneledge Farm Vegetable Chili made by Kim and Mickael of Paradis to Go http://paradistogo.com. There will be Stoneledge Farm Coffee, and water to drink. We ask that members bring a dish to share so that lunch is a giant potluck get together. If possible, please bring your place settings, utensils, and cup. No pets, please. Make a getaway out of it and enjoy the Catskills! Use this link and plan your trip today. A quick reminder since Labor Day falls on a Monday, September 3rd our pick up that week will take place on Thursday, September 6, 2018. Tortillas and shredded cheese – Saute your vegetables and greens mix in a little cheese voila and a quesadilla. Grains – Wheat berries, farro, rice, couscous, bulgur, quinoa…and any other grain you can think of can be tossed with roasted bite-size vegetables and your favorite cheese, drizzled with olive oil and either vinegar or lemon juice and made into a delicious salad. Grains can also be a nice addition to frittatas, soups and other dishes you might make with your CSA bounty. Beans – Whether dried or canned, having lentils, black beans, garbanzos, canelinnis, pintos and other beans around means you’re never stuck if you forgot to take the meat out of the freezer. Make soup, a burrito, a salad and more with this inexpensive protein. Soy sauce, rice vinegar and brown sugar – These three ingredients plus your vegetables are all you need for a stir-fry. Adding grated ginger (keep it in the freezer) and chopped garlic makes it even better. It’s worth investing in a bottle of toasted sesame oil to drizzle on top of the finished product. Good olive oil – buy a good bottle and use it only for making dressings or drizzling over dishes just before you eat them. Buy a cheaper bottle for cooking. Salad dressing ingredients – You may have your favorite recipe, but homemade dressing is the perfect complement to fresh spring greens. I always start with a dollop of Dijon mustard, add a pinch of salt and pepper, some chopped herbs if I have them, then one part vinegar and three parts olive oil (more or less, depending on your taste). Shake or stir it up and you’re ready to go. We are lucky enough that Stoneledge picks our vegetables the day before pick up. The vegetables are fresh and at the peak of flavor. Try to eat the vegetables that are more perishable first. Our first pick up will take place Monday June 4, 2018. There are a few things you can do to ensure a successful season. 1. Clean out your fridge this weekend, this will give you the space you need to store your produce easily. 2. Go to our website (http://www.lexavecsa.com/share/ ) and check out what is coming for the week. We post a preliminary list on Friday evenings and the final counts on Sundays. This will help with your grocery shopping and menu planning. This week we are getting three types of lettuce, radishes, rhubarb, herbs and bok choy. Leafy greens love the month of June. Make sure you have the ingredients to make salad dressing. Lettuce cups and stir fry recipes are great ways to consume your leafy greens if you don’t want to make a salad. One of the best ways to store you lettuce is to wrap it in a paper towel put it in a plastic bowl or plastic bag and store it in the crisper drawer of your fridge. If it takes a few days to get that head of lettuce and it looks a little limp immerse it in a bowl of cold water for 15 minutes it will perk right back up. This works for celery and carrots too! We hope these tips help! If you have any suggestions, recipes, and best practices please share with us. One month to go before the CSA season starts and we have lots to share! Stoneledge is running a promotion called Refer a friend. Any current CSAmember who refers a friend to sign up at a CSA location for the 2018 season, will receive a $10 coupon code to the Stoneledge Farm Marketplace. How does it work? Refer and friend to sign up for the 2018 season at any of the Stoneledge Farms CSA locations. Once your referred friend signs up email the farm info@stoneledge.farm with your friends name for your $10 marketplace coupon! The promotion ends May 31, 2018 The coupon is valid from May 28, 2018, and expires on June 30, 2018. The Farm is hosting its annual spring visit this Saturday, May, 12, 2018 from 1-3:30 PM. This is great opportunity meet our farmer, tour the fields of a certified organic farm and purchase locally grown food, grass fed meat and wool during the visit. Email info@stoneledge.farm to RSVP. Feel free to contact Emily (emily@redsalmon.com) or Christopher (christopher@redsalmon.com) If you have any question. Please note that the signup list will close at 10 PM on Friday, June 1st, 2018 or when we have reached our capacity, whichever comes first. Interested in a half share? Contact us at Lexavecsa@gmail.com and we will partner you up with another member. We are excited to let you know that Stoneledge's annual Spring Farm Visit is on May, 12th, 2018 from 1-3:30 pm. This will give you the opportunity to visit a certified organic working farm. You will also have the chance to meet the Kavakos Family, the crew and tour the farm weather permitting. You will also be able to purchase items from the farm's Market place and neighboring farms. Want to see the progress Stoneledge has made this planting season? Go to Facebook. Lexington Ave CSA is accepting new members! CSA (Community Supported Agriculture) lets city residents get access to high quality, fresh picked produce locally grown by our certified organic farmer Stoneledge Farm in New Cairo, NY. How does Lexington Ave CSA work? People pre-pay for their produce in the winter and in the spring and our farm delivers the fruits and vegetables once a week for 24 weeks during the summer and fall. Starting Monday, June 4, 2018 you will get 7-10 vegetables that are picked every Sunday until Monday November 12, 2018. Fresh picked heirloom vegetables taste great! The 2018 CSA season is quickly approaching our Farmers will be planting seeds over the next few weeks. It has been a busy winter for our Farmers Pete Jr. and Candice not only were they getting the farm ready for the 2018 growing season. They welcomed their daughter Grace into the world this winter. Hopefully, Grace will continue with the Kavakos tradition of certified organic farming. Stoneledge revamped their website making it mobile and user friendly. The new website will now allow share partners to pay for their part of the share separately and access the market place with their own user name and passwords. You also have the option of paying for your shares over the course of four payments. The site also has a recipe page to help inspire your cooking! Regarding the 2018 growing season. Peter Jr. reported that he is experimenting with different winter squash varieties. Last year they found how well the protective nets allowed our cauliflower to flourish. They are going to test the nets on our leafy greens this year. They are also experimenting with a variety of organic popcorn that can be ground into cornmeal if you choose. They hope to send a herb transplant for our members this year again. Deborah, our original famer and Peter’s mom decided retirement was boring and began raising Merino Corriedale sheep. Yarn made from their wool will be on sale through the market place this season. The farm will be hosting a Farm visit at the end of May we will keep you posted with the date. This week's share is heavy on summer staples: tomatoes, peppers, hot peppers, red onions, golden beets and eggplant. This is a great week to make some Mexican recipes! Though you'll have to buy some avocados and lime, try a classic guacamole with this week's red onion, hot pepper and cilantro (Jamie calls it coriander in the recipe) and tomato (doesn't have to be a cherry tomato!) . Watch out though, you probably only need half of one of our share's peppers, they're HOT HOT HOT! Or try a tomato salsa! I've sent this recipe before, but I thought I'd send again... Mark Bitman's raw beet salad is wonderful with Golden beets as well! (and less likely to stain everything in sight like a red beet). ALSO KEEP IN MIND: This week's pick up will come on Thursday Sept 7th instead of Monday September 4! We hope that you will mark your calendar with the upcoming Fall Farm Festival. The Fall Farm Festival will be held on the farm September 2nd from 11:30-3:00. Please use the 145 Garcia Lane, Leeds, NY 12451 address. There are directions on the farm website Contact Us tab or using your GPS. If you are traveling from NYC you might be interested in the bus that Chelsea CSA in sponsoring. $5 per person, if you are interested click HERE and sign up ASAP. Space is limited. The Festival is a great day to come to the farm and see how your vegetables are grown, meet your farmers and walk the fields. We have the grill hot and will have pork as well as grilled Sweet Corn and Portobello Mushrooms and vegetarian chili. Pork and Chili will be made by Kim and Mickael of Paradis to Go http://paradistogo.com. There will be fresh fruit, Stoneledge Farm Coffee, and water. We ask that members bring a dish to share so that lunch is a giant pot luck get together. If possible, please bring your own place settings, utensils, and cup. No pets, please. Heather Ridge Farm- Local grass fed meats for sale. Lime Kiln Farm will be attending with local artisanal cheeses. *Please, bring a freezer bag if you are interested in purchasing any of these items. This week's email will focus on the mystery ingredient: Tomatillos! If all else fails go simple: stir fry them 10 minutes with green peppers, onion, garlic and zucchini for a vegan fajita filling! Enjoy your tomatillos as you try to beat the heat this week! I haven't heard from anyone about the recipes in a while, so I'll take that to mean that you are settled into a routine with how to use your share. Each week I find I have to hold the veggies in my hands before I can formulate a plan for what to do with them..
Tuesday: Julia Child's classic Potato and Leek soup -- so simple, so good. I'll pair it with a crusty bread, Artisan bread in five minutes a day if I can find the time... or a baguette from Fairway. Wednesday: Guests! Jamie Oliver's Basil Pesto (again!) with brown rice rotini and a baby spinach/parsley salad with goat cheese, walnuts and fresh fruit. If I have time, I'll mix up my favorite Smoky Maple Dressing (secret ingredient: lapsang souchang tea... yum). I may saute some chicken thighs in butter to add protein. Friday: Pizza with pesto, sliced tomatoes, and mozzarella and some green pepper and broccoli (if I can get away with putting veggies on pizza!). Saturday: Bean soup with onion, celery, carrots, chicken broth, green peppers and whatever else needs to be used up. Sunday: A reheatable chicken curry meal from Costco. You can't cook every night. Ok, enough about me, what about you? What one dish is on your menu this week? Did I leave out any of the share this week? How can we use it all up? This week's email will focus on green beans, kale, zucchini and tomatoes. I haven't included many kale recipes yet, because its such a hardy year-round veggie I know we're not done seeing it yet. But don't fret! Try this recipe for Garden Greens Goddess Pizza (yum!) or Cold sesame noodles with Broccoli and Kale. If you are looking for new ideas of what to do with your zucchini, try making zucchini butter to use as a spread on many things (or eat right out of the pan. Feeding someone gluten-free or paleo? Try this zucchini pizza crust that looks really yummy. Use your slicing tomatoes this week in a red lentil curry. And finally, if your little sungold tomatoes are crying out for some special treatment this week (and you haven't yet eaten them all right out of the pint box), try marinating them to spread on toast with burrata cheese. Ok, I hope that give you some inspiration! Most of all, I hope you enjoy!If at any time, you find you're not enjoying the recipes, feel free to send me feedback or ask to unsubscribe from the recipe emails. Likewise, if you discover a fantastic recipe for one of our ingredients, please share the wealth! Special thanks to Nadine Nader who has passed along to me a stash of many helpful recipes. Hello Fellow lovers of farm fresh vegetables! Are you still loving your share? Some weeks it can feel hard to love this unruly assortment of veggies. Or to eat them before they go bad. But we are at the peak season right now with a lot of yummy and diverse ingredients to work from (those tomatoes! ), so I hope you feel inspired and not too overwhelmed. Purple basil looks different in a recipe than green basil, so use it creatively! Last night, I put some in a pesto that turned out yummy but sort of brown looking. Ha! If the purple color puts you off, Nadine recommends breaking up the basil leaves and mixing them with sea salt to cure for a week or two-it will give its flavor to the salt, but not the color, you could also try this quick recipe for basil salt from the food network. Candice at the farm also recommends placing a good number of the leaves in white wine vinegar. Or how about eggplant and spicy shrimp in a stir fry? Its our first week seeing sweet peppers and onions, you may consider trying this grilled bread salad with roasted peppers and onions. Or with the celery, try a simple summery soup like this seasonal white bean soup with spring onion, pepper and celery from Martha Rose Shulman at the New York Times. Whatever you choose, I hope you enjoy the week and share with the rest of us what works for you (and what doesn't!) this week. If at any time, you find you're not enjoying the recipes, feel free to send me feedback or ask to unsubscribe from the recipe emails. I hope you are staying warm and dry this gray rainy Tuesday! This week's share is generous, showing off the great year they are having at the farm. Candace from Stoneledge Farm writes that since last week was sunny the tomatoes were thriving. They are also celebrating this years garlic harvest, writing that "The garlic is the best garlic harvest we have had in 8 years! It is beautiful! The past winter and prime soil conditions really helped the garlic to thrive. The cold and the blanketing snow was key! The garlic will hang to cure in the barn for 3 months. We are very excited to hand it out!" Since Candace also recommends to use the basil right away, consider a simple basil pesto--wonderful spread on pizza and bread, or tossed with pasta. Keep in mind that you can use other nuts like almonds or walnuts (because pine nuts can be pricey! ), or add in other greens (like a few leaves of the spinach). You can also leave out the cheese and freeze the pesto in an ice cube tray to keep it up to six months. Just add the cheese when you thaw. A great way to use the lovely eggplants this week would be an eggplant parmesan--find my go to recipe from Jamie Oliver here. I like his recipe because it cuts out the step of breading and pan frying the eggplant, roasting it in the oven for a few minutes instead. The simpler the better! July is for grilling, so you might enjoy eggplant burgers--a great vegetarian grill substitute (No grill? Me either. Try your oven's broil setting). This recipe includes a layer of melted dressing, spices and cheese that adds zip. Another great option for eggplant is to curry it! Try this yummy recipe for an eggplant and tomato curry. Are you stuck on any of our ingredients this week? Be sure to ask at pickup or shoot me an email if you are having trouble with anything! This week's veggies took up less space in my shopping bags but were heavy with goodness! The buzz in the pickup line today was that it's a great week for pickling. If you'd like to make quick "refrigerator pickles" that will last a week or so in your fridge try a recipe like this one from MarthaStewart.com for a sweet bread and butter pickle flavor. Follow along with the video here! Thank you to Charles for recommending these great links! This is the second week we've seen eggplant in our shares. Gwendy has sent along a recipe for steaming eggplant in the microwave that might come in handy for you on a day when you're in a rush. A few friends who purchased the fruit share mentioned that they were disappointed that their cherries aren't too sweet. Baking with cherries that are less sweet is a great way to use them up. Try a roasted cherry dutch baby for example, or save yourself the need to pit the cherries and make a simple cherry syrup. In a large bowl, beat the sugar, oil, eggs and vanilla until well blended. Combine the flour, cocoa, salt, baking soda, cinnamon and baking powder; gradually beat into sugar mixture until blended. Stir in zucchini. Transfer to two 8-in. x 4-in. loaf pans coated with cooking spray. Bake at 350° for 50-55 minutes or until a toothpick inserted near the center comes out clean. Cool for 10 minutes before removing from pans to wire racks to cool completely. Yield: 2 loaves (12 slices each). Hello Lex Ave CSA subscribers! Welcome to week 6! Make sure you scroll all the way to the bottom to get the latest important reminders from the CSA core members. The cucumbers and mint promise to make some truly refreshing cold drinks for these hot July days. Try them in cucumber lemonade or cucumber mojitos! The fennel is an ingredient we haven't seen until this week. Play up the licorice flavor in the bulbs by sauteeing them in a rich sauce for roast pork (if you eat pork, that is). This Kitchn list of five ways to use fennel stalks and fronds also points out that fennel pairs well with fish or can be added to stocks. If you still feel lost, try this crowd pleasing fennel parmesan gratin that will convert even a fennel skeptic. As you enjoy your summer squash, you may find that Alton Brown's recent Food Network episode interesting. He includes a recipe for overstuffed patty pan squash (those UFO-looking ones) that is definitely worth trying. (Video here and recipe here). Enjoy your eggplant with a recipe like this one for easy ratatouille with chicken (or without if you don't eat chicken). Escarole is the last veggie that seems tricky to me this week. Candice at the farm writes: "It looks smaller to lettuce but it is an Italian cooking green. It pairs well will Chicken and beans. It is very popular cooked with white beans. It is a bitter green but has a milder flavor when cooked." Try this recipe for charred escarole. And for those of you subscribing to the fruit share (or even if you aren't), Nadine especially asked me to revisit a recipe she sent last year for crustless blueberry pie, which mixes up in ten minutes or so, but looks amazing! It is the height of blueberry season, so enjoy! Any orders placed by noon on Friday are guaranteed to be delivered at Monday’s pick up. Orders after noon on Friday may not arrive until the following week. If at any time, you find you're not enjoying the recipes, feel free to send me feedback or ask to unsubscribe from the recipe emails--I won't be offended! The farm sends word that the rain and sun have come in a very nice balance this year, so crops are flourishing! This week we will see Napa Cabbage for the first time. Fellow CSA member Rebecca sent this yummy recipe for spicy stir fried cabbage along the last time we had a cabbage variety in the box. She added water chestnuts and cashews, then substituted red bell pepper for the carrot. Delicious over rice! If you'd like to try something different with your cabbage, consider Shoyu cabbage soup, Cabbage and mushroom "lasagna," or even caraway cabbage chips with dill yogurt. But if you are paralyzed by all these choices, remember that cabbage will last pretty well in the crisper drawer of the fridge for up to a month or longer. We will also see another head of Frisee in our boxes, why not try a special salad that features this lettuce with pears and manchego cheese (one of my all time favorites!) Pears go so wonderfully with the slightly bitter greens and tart, spicy mustard! If you don't have pears on hand you could also try this recipe for Lyonaisse salad with apples and bacon vinaigrette. It's our first week seeing summer squash! If you'd like to try something decadent with the squash consider this cheesy gratin made with salsa verde. If you are looking for something lighter and more summery, try this couscous salad with the sweetness of sultanas (or raisins), the crunch of pistachios, and the freshness of mint. I hope that gives you some interesting ideas! Hello Lexington Ave CSA subscribers! I'm woefully late with the recipe email this week, I've had a whopper of a few days, but I wanted to share a few favorite recipes that use week four's ingredients. Week Four was the first week we've seen beets in the boxes. Try these two different takes for different approaches to this yummy ingredient. In one, the beets are chopped roughly in a food processor (you can also grate them) to make a surprisingly yummy cold salad that will keep well in the fridge for several days. In the other recipe from Bon Appetit's "Cooking without recipes" series, the beets are grilled first, to release their earthy sweetness, then mixed with herbs and spices. This is also our first week to see kale. It can be a bit of a polarizing leafy green, but I love it! Try this recipe, from the same Bon Appetit series, to mix the kale with a can of white beans and come out with a simple, yummy meal. We had chard in our boxes for the second week, and I couldn't get my six year old daughter to slow down when I served it in a simple gravy over rice (a bit like this recipe from Smitten Kitchen, using our garlic scapes instead of green onions, and subbing chicken broth for milk. It can also be yummy to add sauteed mushrooms!). You just never know, eh? What did you discover in your box this week? Which ingredient are you most looking forward to this season? Be sure to let me know! The first is Kohlrabi. This Kitchn list of five tasty ways to prepare this off-the-beaten-path veggie may inspire you to try something new. This Martha Stewart recipe for slaw looks especially promising! The next new veggie is garlic scapes. This flower bud of the garlic plant brings garlicky goodness home early in the season. It is wonderful to add garlicky flavor to anything, but I especially look forward to trying this yummy grill recipe soon. Have you ever tried Purslane before? I haven't! I love the creative ideas here though, (especially the one with yogurt). Looking forward to making a first attempt! Does anyone else compost your veggie scraps? I hear you can drop off food scraps at the 96th Street entrance to the 6 train on Wednesday mornings between 7:15-10:30am, or at the Greenmarket on 1st Ave between 92nd and 93rd on Sundays between 9am and 1pm (beginning June 25th). This is something our family used to do in Vancouver (it was required and managed by the City!) and we would like to start doing again. Let me know if you have any tips for composting in the city! If at any time, you find you're not enjoying the recipes, feel free to send me feedback or ask to unsubscribe from the recipe emails--I won't be offended! Nobody wants an inbox cluttered with unwanted information! I hope you've enjoyed your first week's bounty as much as we have! I can hardly believe how tasty, satisfying and filling it is to eat farm-fresh, organic greens daily. This week we can look forward to more leafy greens. Make sure to use up the spicy cut greens like arugula and mizuna earlier in the week as they may be packed with nutrients, but they don't tend to last as long. Check out these 7 ideas for using mizuna. Bringing your salads to work or trying to keep motivated to enjoy them for lunch? Try these 5 tips for packing a week's salads ahead on Sunday (or Monday) night. Looking for ways to branch out from the salad? Try using the ribs and outer leaves you might have wasted to make a soup (arugula and spinach also invited for the fun). Or try this slideshow wittily entitled "Spring Lettuce: 15 ideas, zero salads." Curious about how to keep your basil transplants alive and thriving? Check out this post about growing basil. Many thanks to Dorota for passing along a recipe for Italian style bok choi with cannellini beans. The recipe is a good reminder that it's okay to break out of the mold and use an ingredient we typically associate with one type of cuisine (like Chinese wok cooking) and use it in other ways. I'm excited to take on the task of sending out recipe emails this year. The goal is to help you feel inspired about how to get the most use out of your vegetable share week by week. This week's share is heavy on lovely leafy lettuce. Don't let it go bad before you can eat it up! This video includes a great trick for storing your lettuces so they will stay fresh for up to three weeks. Boc Choi is wonderful in stir fries or as a steamed side. This list of ten ways to love this Asian ingredient will inspire you to think about it in different ways. I don't know about you, but rhubarb is one of my very favorite unique spring ingredients. Its tart flavor mixes wonderfully into sweet treats like coffee cakes,pies, and jams. It's especially yummy paired with strawberries, but don't be afraid to try it on its own. If at any time, you find you're not enjoying the recipes, feel free to send me feedback or ask to unsubscribe from the recipe emails--I won't be offended! Nobody wants an inbox cluttered with unwanted information! Likewise, if you discover a fantastic recipe for one of our ingredients, please share the wealth! We received several request regarding our plentiful summer squash. These recipes specifically say Zucchini, but I have substituted other summer squash. 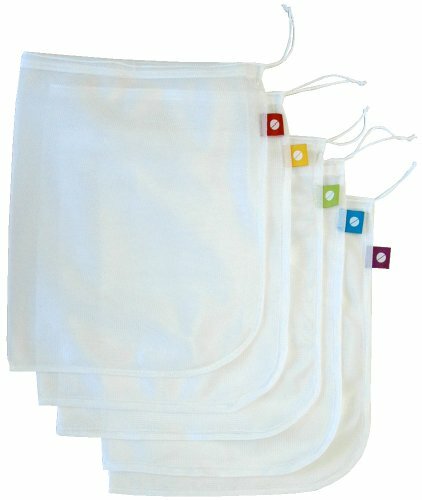 Here are a few recipes that I love or have gotten solid reviews from my other CSA friends, hope these suggestions help. Thank you Jennifer Hessman for this recipe! As many of my clients, teammates, friends and family know, I love to eat seasonally, locally and as much as possible organically. As long distance runners who put physical demands on our bodies, we need to replenish our bodies nutritionally. Eating foods that are abundant in season are not only delicious, they provide us the necessary vitamins and minerals our bodies need for the current season and the season ahead. I am sharing several recipes using seasonal ingredients. I often cook and prepare many of my meals vegan and or vegetarian, but I have noted how to make each of the recipes with dairy and/or meat to please carnivores too. Great food to carbo load before a long run and perfect for a post-run recovery meal. Serve with tomatoes or as a dip with crudite, crackers or bread. You can toss this on your favorite fish, eggs, vegetables or pasta dish. Salt to taste. Add dried hot red pepper, oregano, basil to veggie mix to taste. 1 lb of ground beef or turkey (optional) - Brown the meat and add leftover sauce. Serve on side for meat eaters. 1. Slice up eggplant, onions and peppers, salt to taste (absorbs some water) and roast at 400 degrees for 30 minutes. 2. In 9” x 13” pan, layer as follows: olive oil, sliced tomatoes, noodles, greens, noodles, cheese, roasted veggies and any spices, noodles, tomatoes, cheese. Add sauce to make sure all noodles are covered. Use extra sauce for the meat sauce on the side. 3. Cover and bake at 350 degrees for at least one hour. Remove cover and cook as long as needed for top layer of cheese to melt and brown a bit. Remove from oven and let set for 10 minutes. 4. Cook meat in a skillet, add sauce and serve on the side. If you are interested in handling this section please email me. Here are a few things that may come in handy throughout the season! Any Amazon affiliate income goes straight back into the CSA and is not used for anyone's personal profit. 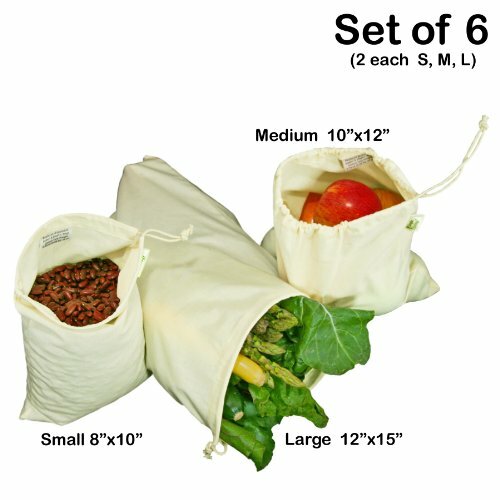 The re-usable flip & tumble veggie bags are super handy for storing greens and transporting individual items home without crushing them. 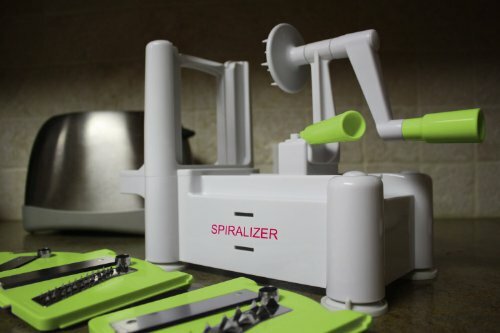 The Spiralizer is a great way to mix things up, especially when the summer squash starts flowing...think veggie noodles. 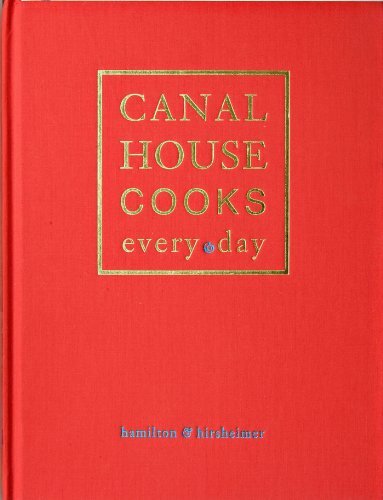 The Canal House series is wonderful, but this big book of Canal House Cooks every day will be very relevant and matches up well to our CSA season.